My previous post about conditional logging received quite a few responses, with several people pointing out that littering your code with #ifdef DEBUG statements is both ugly and error prone. Karl Kraft, for example, created a new DebugLog class as a drop-in replacement for NSLog. Since NSLog has been around for quite a while, there have been many solutions to this problem. Use ALog for cases where you always want log output regardless of the state of the debug flag. I like this preprocessor macro approach because you don’t have to carry around extra classes in all your projects. Just a few lines of code to paste into one file in your project. But I think we can improve it further. A drawback with this macro is that it requires you to add a “%s” to all your log statements, e.g. DLOG(@”%s foo”); instead of NSLog(@”foo”);. So it’s not a drop-in replacement for NSLog. Set the DEBUG variable in your project as described previously. Update: If your project is 3.0 you may need to set the DEBUG variable this way. I’m sure there will be further improvements to this. Comments are open as always. A simple method to debug your iPhone application code is to use NSLog() statements at strategic points. I often find myself printing out the response from server calls using NSLog. Even after the iPhone client development is done, these log statements can be useful to debug server issues. But you obviously don’t want to fill the console log in your released code. Unfortunately Xcode does not automagically define DEBUG when you do a debug build. So you have to add a definition to your project target. 1. Be sure you select Debug in the Configuration drop down. 2. Select Settings Defined at This Level in the second drop down to reduce the number of fields shown. 3. Now click the tool button in the bottom left corner and select Add User-Defined Setting from the menu. Now when you build and run in debug configuration you will see the log messages, but those lines of code will not be included in your release builds. Update: Use GCC_PREPROCESSOR_DEFINITIONS instead of OTHER_CFLAGS. See comments below. The first rule of performance tuning is to measure your performance. If you don’t measure it, you don’t know if you’ve made any progress or if you’ve made it worse. 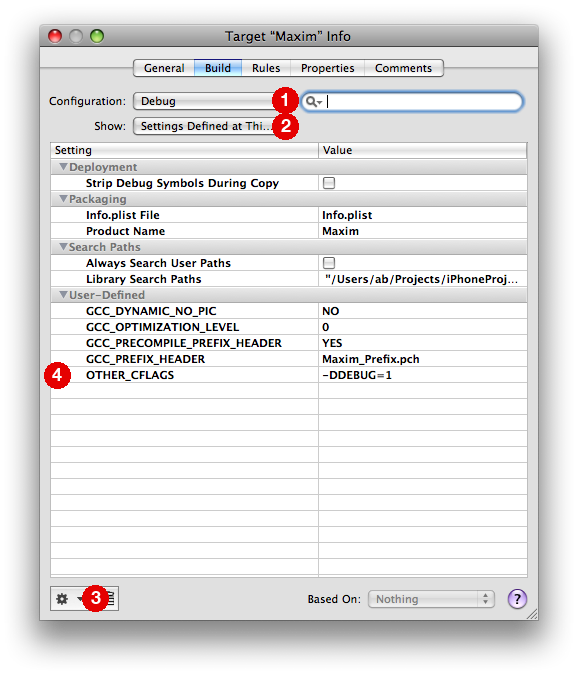 Note that NSTimeInterval is specified in seconds and it has a sub-millisecond resolution. If your code segment executes in less than a millisecond then you should run your code in a loop and measure the elapsed time across 100 or 1,000 iterations to get meaningful measurements. Important: Make sure that you do your performance testing on the actual device and not in the simulator. Some operations are 10x slower on a device than in the simulator, while others are actually faster on the device. The NSLog statements will show up in the Xcode Console window if you launch the app on the device from Xcode. You can also view log statements as warnings in the Organizer window in the Console tab.